The most incredible views from any California campground are at Kirby Cove. Just north of the Golden Gate Bridge, this highly sought after spot has it’s own beach and five campsites with panoramic views of the city, gazing up at the Golden Gate Bridge. Kirby Cove welcomes daytime hikers for picnics and beach strolls, and invites overnighters to cozy up under the stars. The journey down to the site is steep and narrow, sorry RVs you can’t fit, under eucalyptus canopies and through misty fog banks. 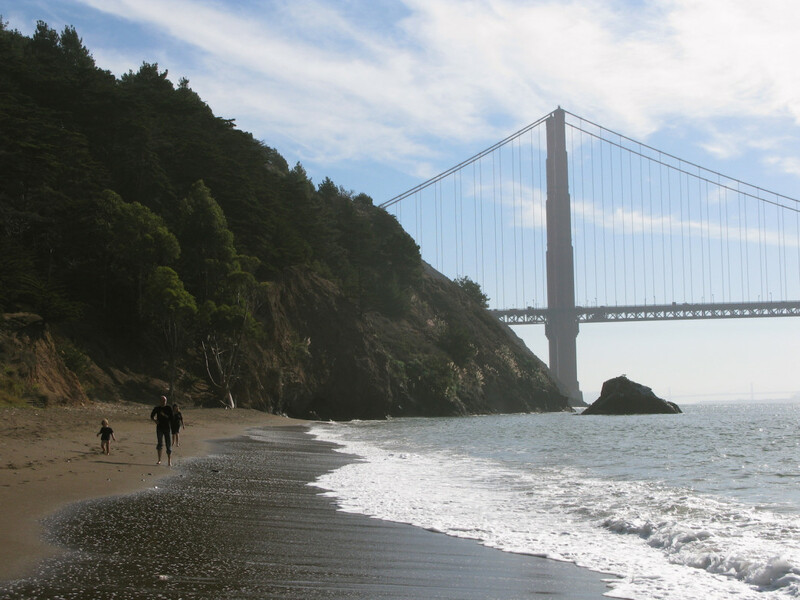 Located in the Marin Headlands, just off of Highway 101, it’s easily accessible and quite unforgettable. Kirby Cove is without a doubt, the best location for a campground in the Bay Area. It’s on the water, just west of the Golden Gate Bridge and San Francisco. It’s close enough for an evening campout just outside city limits, and perfect for groups and families. It’s a rustic experience with no drinking water or bathrooms. A limited number of cars are allowed to park at the site, so it’s recommended to backpack in. Kirby Cove is truly loved by all. It’s so beautiful you could even consider it glamping— showcasing glamorous view of San Francisco right on the water’s edge, nestled under the Golden Gate Bridge. It’s well kept, peaceful and just the right amount of secluded. The beach is clean, with gentle waves and local wildlife (bring your fishing poles!) And you can daydream, watching the fog crawl through the Golden Gate Bridge or follow sailboats as they dance along the Pacific. It’s a camping paradise and perfect for a relaxing getaway. Right off the Golden Gate Bridge, take the first exit, Alexander Ave. Drive up the steep road, following lookout points at the North side of the bridge. The Cove’s access road is gated, needing the correct combination to unlock it. Follow the steep road down about one mile. There are a limited number of cars per group, varying on the size of the group. Water and bathrooms aren’t available, come prepared and bring enough water for your visit. Sitting right on the water, the campground is often chilly, getting hit by fog and heavy winds during the summer. Bring earplugs if you plan to stay overnight, the fog horn booms all hours of the night.